Yesterday my day started as it often does ~ emails at home, coffee on the run, breakfast at my desk. I had my day planned and a good sense of what was on deck for the balance of my week when it happened — a call suggesting Thursday’s meeting be moved up two days. To yesterday. To 2 hours from that phone call. Looking at my “to-do’s” and schedule, my first thought was to say no and find a way to keep it to Thursday. Then, I thought about just saying yes. No: I wasn’t in a suit or dress, but I was in office attire, and with the cold wind blowing I’d be wearing my overcoat anyways. Yes: moving up the meeting worked better for the rest of my week because I’m hoping to take Friday off. Not having to be in meetings and on the road most of Thursday would support that. Another yes. And then a nudge, “just do it.” And so I did. And had I not done that I wouldn’t have had a chance meeting on the street (in my overcoat) with a State official whose office I’ve been aiding. I wouldn’t have had the chance to meet her staff who then sang my praises to the official. Happenstance? Hmm. Smiling as I arrived back into town, I pulled into the parking lot at the mall. I hate the mall. Not the building, the experience. I’m short, curvy and hard to fit. Generally speaking, the mall isn’t the happy place it was when I was a lanky teenager. This morning, my arms ache from the clothes I carried out of the dressing room. Clothes on sale. Clothes that fit and flatter me. Coincidence? Hmm. I don’t know about you but sometimes life lessons don’t appear on large blinking billboards. Sometimes they arrive disguised as ordinary moments that beg a closer look. And remember, friends, “Normal is just a setting on your washing machine” ~Whoopi Goldberg. What have you said “yes” to lately? Love it. Sometimes things happen for a reason. Sometimes things happen for a reason and we don’t notice it. We have to be more aware of what is happening and enjoy it. I like to get things done earlier in the week than later. That makes for a more peaceful weekend. The last thing I said yes to was yesterday, after working all afternoon outdoors, my husband said let’s go to our local bistro for dinner (despite the fact that I took food out to defrost for supper). It ended my day perfectly. Sounds like everything fell right into place! Love that quote…. Yeah, love the quote. And the attitude. 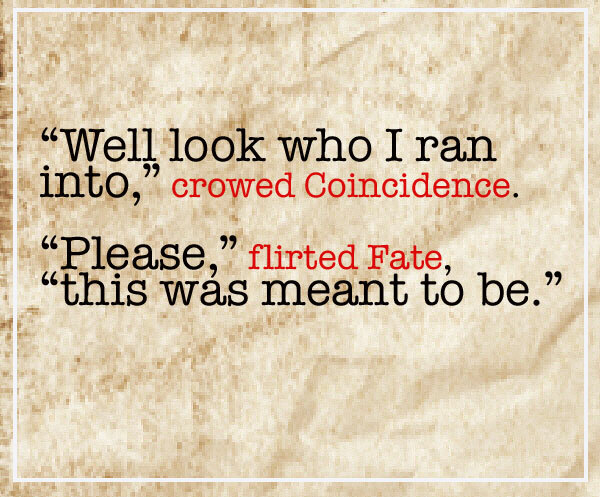 Meant to be. Thank you, and thanks for visiting ~ come again! Seems to me that you have a natural ability to go with the flow, to find the silver lining no matter what the circumstances. Of course, you didn’t have to look far for that silver lining in this case!